Giant Tetris gets smaller. Still pretty damn huge. 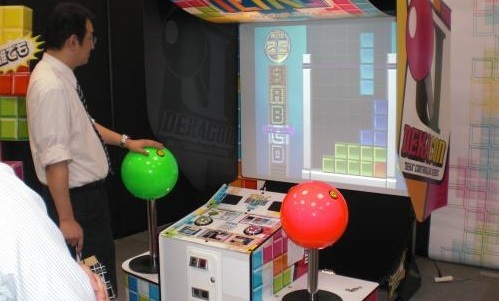 You may have seen images of this massive Tetris arcade machine from Sega around the place, probably because the damn thing is so amusingly gigantic that I don’t know what arcade would be willing to pay for you to see it in person, especially with the $10,000 price tag. Arcade Heroes report however that there is now an October 2010 release date for a smaller version of the machine, replacing the up to 150″ projection screen with the contemporary arcade style LCD screen, which they also have a image of showcased on their site at the moment. Of course it is still 47″ which is pretty huge wherever you encounter it, but the new price has also shrunk down to a more reasonable $8,000. Still, an American release date and less taxing physical requirements are pretty promising for gamers in the modern market. I can’t remember the last time I ever saw a puzzle game in an arcade, and I think the Tetris name alone, along with the novelty of colossal force feedback joysticks could do something to revitalise that kind of enjoyment over in the West. That or the arcades die out entirely and my soul is crushed. Please don’t let that happen. Please? Every arcade game should use those joysticks. Track N’ Field would give you Brad Nicholson arms after a couple of games with these badboys.